KARL MAYER launched a new generation of highly efficient, multibar fall-plate machines at ITMA 2015. The productivity of the first machine in this range, the MLF 46/24, 242″, was twice that of its predecessor. This new machine became very well established on the market, and was upgraded the following year in time for the ITMA ASIA + CITME 2016 exhibition by equipping it with more guide bars. The MLF 60/32 delivers the same efficiency and quality as the low-bar version, but enables a wider range of patterns to be produced. Larger and more opulent motifs and a wide variety of edge borders can be worked. 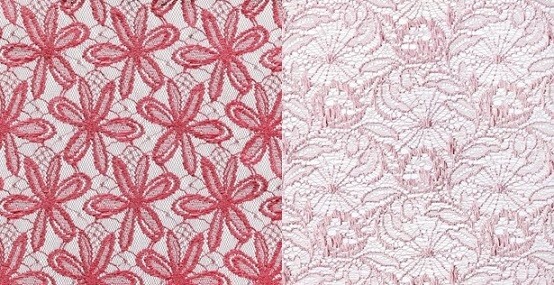 The samples of all-over lace shown here illustrate the exceptional features of the MLF 60/32. The samples were produced in a gauge of E 24 and, despite their different looks, were processed with just a single needle repeat. The 144 needles worked one repeat to create the large-format design, two for the filigree areas and three pattern repeats for the star-shaped flowers. As well as varying the dimensions of the motifs, the appearance of the ground can also be varied extensively. Open spider-web constructions with a jacquard look, processed with the ground and pattern bars, can be produced on the MLF 60/32 just as easily as a simple tulle ground, whose subtle, jacquard-like constructions enhance the overall effect. The lace fabrics were produced by Erke Textile. This Turkish company was founded in 2004 as Beeteks Tekstil, producing stretch powernet, embroidery grounds and tulle – all on KARL MAYER’s machines. In 2014, this manufacturer extended its production capacity to incorporate jacquard raschel machines. The patterns were created by the designer, Wolfgang Häusle, who is based in Obertshausen.